Home » Embedded Computing Design » How important is "instant on" to your automotive application? It’s a fact of life these days that people want things now. In fact we’ve become so accustomed to real-time or near-real-time response from our phones, Internet connections, and every other element of our digital lives that we expect them as quickly as we can act in the analog world. If we don’t get one we automatically assume that the device is broken. This phenomenon is no truer than in the converging technologies within automotive system. Today, automotive systems are integrating consumer technology at a breakneck pace as automakers attempt to make cars an extension of their user’s digital experience. But what accounts for those fast response times in many consumer devices, NAND flash, still isn’t fast enough for the safety-critical advanced driver assistance systems (ADAS), in-vehicle infotainment (IVI) platforms, and instrument clusters within vehicles that need to power on in an instant. As a result, memory designers are turning to NOR. NOR flash was first developed by Intel back in the ‘80s, but its usage began to plateau as NAND technology exhibited faster write times and lower pricing at high volumes. However, NOR flash does have one distinct advantage when it comes to critical instant-on applications, a feature called execute-in-place, or XIP. XIP technology allows processors to execute code directly from the native memory device rather than it first having to be copied to RAM, as is the case with NAND flash. Of the two common types of NOR flash on the market, however, there are tradeoffs. Serial NOR technology offers reduced pin counts for reduced design complexity, a smaller overall package size, and lower cost, while parallel NOR flash brings higher XIP performance and package times. Historically this has meant decision times for design teams, but recent advances in NOR memory are looking to change that. Earlier this week, Micron Technology released its XTRMFlash memory solution, a Serial NOR flash product that utilizes a dual-mode synchronous bus running at 200 MHz for improved memory bandwidth. 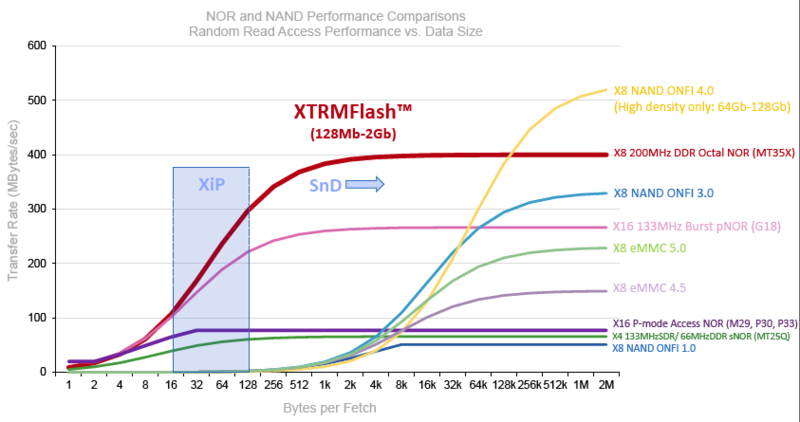 The XTRMFlash interface enables read speeds up to 400 Mbps, a benchmark that is competitive with NAND flash offerings, and also maintains XIP performance the company says is the fastest available to designers. While not based on the traditional SPI interface used in serial NOR, the XTRMFlash interface provides backward compatibility with SPI-based NOR flash to provide an upgrade path for legacy users. The new take on NOR flash also meets automotive temperature and reliability requirements, and includes security provisions to help safeguard modern connected vehicles. There’s a lot less news these days around NOR than NAND or SSDs, but I feel that people don’t understand the importance NOR flash plays in the industry,” says Richard De Caro, Director of NOR Flash for Micron’s Embedded Business Unit. “For the brains, the processors and MCUs in everyday applications, the NOR flash what’s externally storing all the boot code and other critical code. So, how important is instant-on performance to your automotive application? 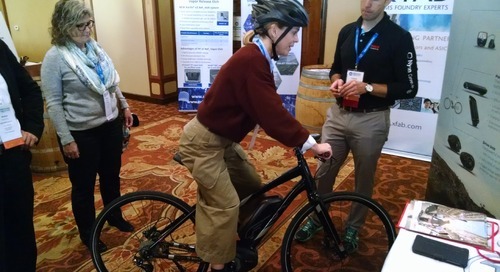 For more information, visit www.micron.com.